I often tell people that I use Silvia Trkman’s methods to teach the see-saw. Which is, I like to teach them to slam cupboard drawers or doors first. I like this method because it teaches them to be super confident about moving things with their feet (THEY are in control and you reward big time for the strongest pushes) and they learn that a big loud BANG noise (like when the seesaw hits the ground) means jackpots! Lumen – my fairly sensitive (particularly to movements – eg. she hates walking across the suspension bridge at the local park because it wobbles a bit) LOVES the seesaw. Today I wanted to work on the ‘hug the pole’ trick with Loki. 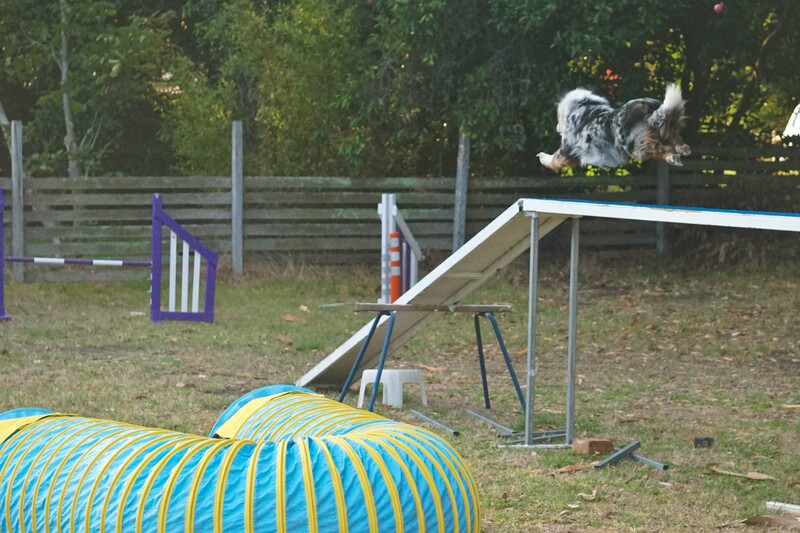 I hadn’t attempted it before because whenever I got out the pole for Lumen he literally ran away. He is terrified of poles. I think one day, back when he was innocent and naive, he was hanging around while I changed a course or putting up a height or something, and I accidentally dropped the bar on his back. It’s not like… the end of the world… except he is a very sensitive BC at times and has a very keen memory for dangerous/hurty things, and this has stuck in his mind. Me setting up courses now sees him lying at the very outskirts of the course, eyeing me suspiciously. Me putting a bar up that he’s knocked sees him trotting a big worried circle far away from it. So… doing the hug the pole trick? Should be interesting. I decided then, that instead of just trying to make the standing upright pole friendly for him, that I would try and help him get over the whole thing. Because let’s face it, sometimes poles fall down. Sometimes I drop them. Being scared isn’t going to help. So I made a game. In much the same way, I’d like to think, as Silvia has made slamming the cupboard doors into a seesaw game, I went and did that. I didn’t necessarily start with the intention of creating a game – I wanted at first to just desensitise him, to show him poles weren’t scary. That poles are, in fact, rewarding! Believe it or not, Lumen is VERY afraid of heights. 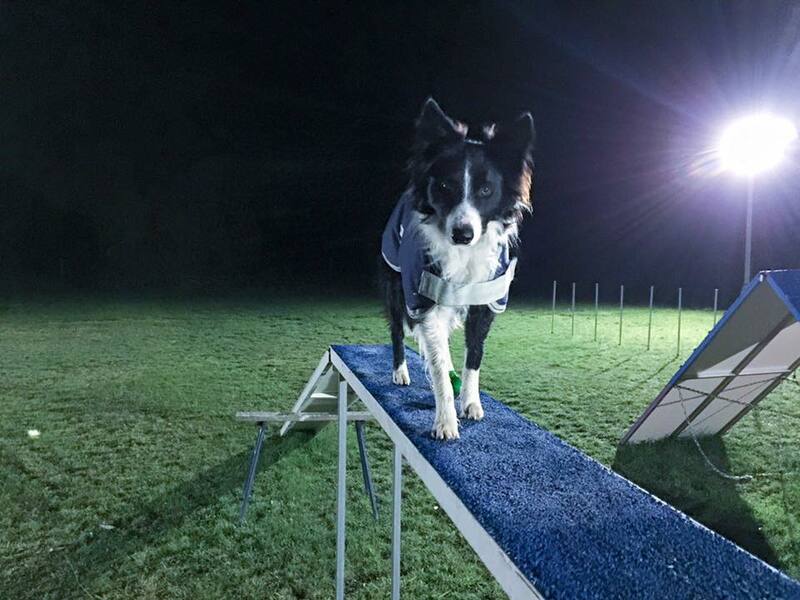 Because training running contacts was a fun game that gradually added height, she will run full speed over a 30cm wide plank at 1.2m no problems. First I had to lay the pole on the floor at my feet. This was scary enough and I rewarded any step toward the pole and threw the biscuit away from it so he had time to ‘get away’. Lumen loves this ‘treat and retreat’ game so I figured I’d use it here, too. Then he got confident that it wasn’t going to fall from the floor onto his head, so I rested it on my feet and repeated the process cos it got scary again. I was clicking for nose and feet touches from him, but aiming mostly for feet, jackpotting if he made it roll or move (but I didn’t let it fall off my feet). Then I held it on a slightly higher angle and went through the process again. Then I lowered it toward the ground like it was a lever, clicking as it went down and dropping the treat near it. This was very scary for Loki but he seemed to calm down as he realised it wasn’t falling and that its movement got treats no matter what he did. Building on that, I then moved onto the soft carpet kind of in the other part of the room and let the pole drop a short way. As soon as it hit the ground, I clicked and threw the treat away from us. Loki had no expectation to participate at this stage, he was simply being clicked for the noise of it hitting the ground, which was softened by the carpet. He coped with this pretty well. I built up from where the pole was dropping from vertical to the ground, with its base on the ground. Then I moved into the room where Loki was (so closer to him) with less carpet and tiles on the floor. This meant sometimes the drop was louder, and on those occasions, he’d get more treats. NOW I started to make it into a real game. I’d get him excited about it by saying “readyyyy?” and then drop the pole, click as it hit, and threw the biscuit away from me. He began to anticipate the pole hitting the ground and going to fetch the biscuit. Now I started to ask him for help. 😉 I wanted him to feel in charge of this game too, and to get a little more bold. I called him over, said “get it!” and he would sort of half-heartedly hit it with his paw. As soon as he did, I’d drop the pole, click and throw a biscuit. We went on like this, jackpotting the strongest hits to the pole. My next stage was to feed him where the pole had landed as he was still trying to spring out of the way – I did this back in the soft carpet room so it wasn’t so scary. Once he was really enjoying hitting the pole with his feet and was happy to stay around while it fell over and eat from that spot, I introduced one final challenge, but only since he had been doing so well. I now held the pole horizontal to the ground, not too high. He hit it with his paws and I dropped it. I built up the height again and as you’ll see in the video below, he was able to really jump up and bounce it and bring it toppling down, and didn’t dart away. There are moments I can still tell he has some anxiety about it but considering I couldn’t even PICK IT UP when we started the session without him running away, he has come a huge way in one short session. Now, of course, if Loki had continued to find me just holding the pole upright too scary and he was anxious, I would have stayed there and come back to it next session, building on where we left off. I would NOT have pushed him past the point where I felt he was happy and confident. Knowing your dog is SO important. Learning how to read him, when to push through, when to reel it back. There were moments I could tell he was anxious, but of course I know it’s not a scary situation – nothing bad’s going to happen, so I could be relaxed about it. I didn’t force him to do anything he didn’t want to do. I never lured him over to the pole – I let him offer any movements towards it, and any interactions with it. I made sure he had plenty of opportunities to get space from it so he wasn’t overwhelmed. I’m writing all this because I think there’s sometimes a “make them face their fears” mentality when dealing with dog fears and I know for a dog like Loki, or Lumen, this would make them so much worse. They sometimes need time to work through those fears, to see that the thing they thought was so scary wasn’t really. For Loki, he became in charge of making the pole fall. It was no longer a random act but HE made it happen. And I never let it hit him, either or I bet all my good work would have been undone. Here is a quick video of the very very last part of our training. I WISH I’d filmed the start so you could see how nervous he was and how amazing this is.